Wing span: 1 1/3 - 1 1/2 inches (3.4 - 3.8 cm). Identification: Extremely variable geographically, with at least 4 subspecies. Wings range from dark orange-brown to pale cream. Underside of forewing usually has a small eyespot near its tip. Underside of hindwing is gray-green with a wavy white median line. Life history: To seek females, males patrol above the tops of grasses with a bouncy flight. First- and fourth-stage caterpillars hibernate in mats of dead grass. Flight: One to two broods from March-October, depending on locality. Caterpillar hosts: Grasses and rushes. Habitat: Grassy, open areas in a wide variety of habitats, including fields, meadows, grasslands, and tundra. Range: Holarctic. In North America from Alaska south through the western mountains to Baja California Norte, southeast Arizona, and central New Mexico; across southern Canada to Quebec and New England; south to Long Island. Isolated populations in Newfoundland and New Brunswick. The range is still expanding in the East. The Nature Conservancy Global Rank: G5 - Demonstrably secure globally, though it may be quite rare in parts of its range, especially at the periphery. Hinchliff, J. 1996. The Distribution of the Butterflies of Washington. Evergreen Aurelians. Oregon State University Bookstore, Corvallis. edition. Houghton Mifflin Co., Boston, Mass. Stanford, R.E. and P.A. Opler. 1993. 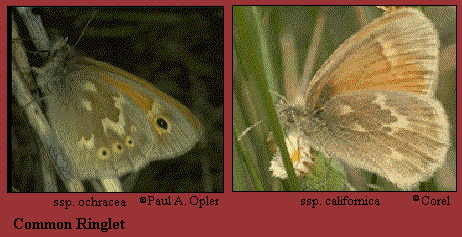 Atlas of Western USA Butterflies. Tilden, J.W. and A.C. Smith. 1986. A Field Guide to Western Butterflies. Houghton Mifflin Co., Boston, Mass.